Most of the classic novels I have read came to me as assigned reading in high school and college, which skewed heavily towards an American author bias. Which is why, despite loving all the Merchant-Ivory-Jhabvala adaptations of Forster’s work, I hadn’t ever read one of his novels. However, the recent BBC adaptation of Howards End inspired me to finally pick up the book, and it was definitely worthwhile! Set in the early 1900s, Howards End tells the story of three families of varying backgrounds who live in London. At the center are the Schlegel siblings- Margaret, Helen and Tibby- who are half-German and live a bohemian existence aided by their wealthy inheritance. They were orphaned in childhood, and Margaret has taken on raising Tibby and Helen for most of their lives. While traveling in Germany, the Schlegels become acquaintances of the Wilcox family, wealthy capitalists with investments in the colonies. Helen later visits the Wilcoxes at Howards End; an estate owned by matriarch Ruth. While there, Helen briefly becomes engaged to the youngest Wilcox, Paul, but they very shortly break off their engagement. Helen and Margaret also befriend working class clerk, Leonard Bast, at a Beethoven symphony where Helen accidentally walks off with Bast’s umbrella. The Wilcoxes later purchase an apartment in London near the Schlegel sisters, and despite some trepidation on both sides, Margaret and Ruth quickly become friends. Unbeknownst to her family, Ruth is gravely ill and worried about the fate of her beloved estate Howards End. Neither her husband, Henry, nor her children really seem to care for it, so she leaves the house to Margaret in her will. However, her husband and children very quickly put the kibosh on that before Margaret ever finds out. Years later after his wife’s passing, patriarch Henry develops a friendship with Margaret and marries her. Meanwhile, Helen becomes deeply entrenched with Leonard Bast and his not-quite wife Jacky, a “fallen” woman whom he feels responsible for and has substance abuse issues. Helen wants to save the Basts from their impoverished existence. However, when a tip from Henry causes Leonard to quit his job as clerk, Helen blames Henry for Leonard’s troubles causing strife between the Schlegel sisters. Howards End is an interesting dissection of class and capitalism in the early 1900s London. The Schlegel sisters, though wealthy, have Socialist sympathies, which put them at odds with the Wilcoxes. Leonard Bast is an example of a working poor gentleman who is unable to move up in the world, despite dedicating himself to the finer things in life- including art and reading. Something the practical, but obtuse Henry Wilcox has no appreciation for. Speaking of Henry, he has to be one of the least appealing love interests in literary history. Thoroughly middle aged, Henry is a good twenty years older than Margaret. Henry is really only good at making business decisions, leading him to often be an insensitive husband. Yet the fact that Margaret loves such a thoroughly flawed man, doesn’t make her a less believable or likeable character. The highlight of this book for me is the depth of its female characters. Helen and Margaret are flawed, but smart and likeable. They often make decisions we disagree with, but you can understand how they arrive at them. The relationship between the sisters is strong and the center of the novel. Likewise, Margaret’s friendship with Ruth flourishes despite the women’s differences. 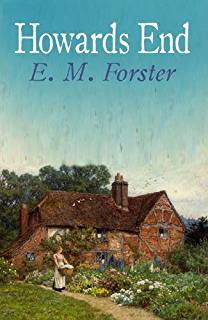 Unlike Margaret, Ruth’s tastes are simple; she loves her family and Howards End. Something that Margaret comes to love as well.